will bring new life into your digital photo collection by turning pictures into stunning collages. With Artensoft Photo Collage Maker, you can turn the image on the left into a perfect photo collage. 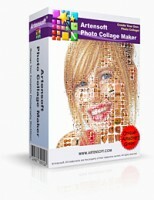 Photo collages produced with Artensoft Photo Collage Maker are of the highest visual quality. They look great from afar and are perfect when scrutinized up close. Artensoft Photo Collage Maker uses sophisticated algorithms to mix and match existing cell images in order to create a piece of art that can be enjoyed from afar and truly appreciated up close.